For the most part, the voting intentions of people in major religious groups closely resemble those seen in polling conducted at a similar point in the 2012 campaign. Roughly eight-in-ten white evangelical Protestant voters (78%) say they would support Trump if the election were held today, just as 73% indicated they would vote for Romney in June 2012. 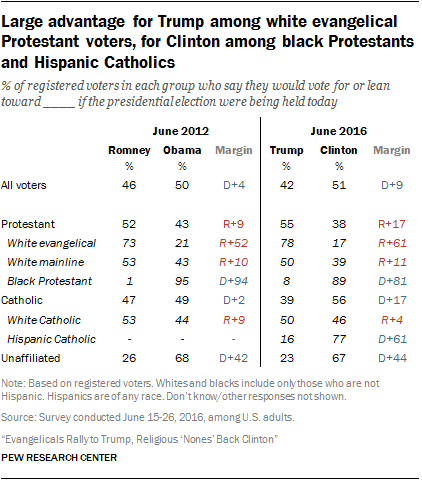 And Trump enjoys about the same level of support among white mainline Protestant voters as Romney did four years ago. At the other end of the spectrum, roughly nine-in-ten black Protestants who are registered to vote say they would vote for Clinton if the election were held today (89%), as would two-thirds of those with no religious affiliation. Currently, Clinton also holds a 17-point advantage among Catholic registered voters, driven largely by overwhelming support for Clinton among Latino Catholics. By contrast, at a similar point in the 2012 campaign, Catholics were closely divided between support for Obama (49%) and Romney (47%). Exit polls conducted on Election Day in 2012 found that Catholics ultimately split their votes between Obama (50%) and Romney (48%). The survey finds a notable shift in the voting intentions of regular churchgoers. Currently, voters who say they attend religious services at least once a week are split almost evenly; 49% say they would vote for Trump and 45% say they would vote for Clinton. 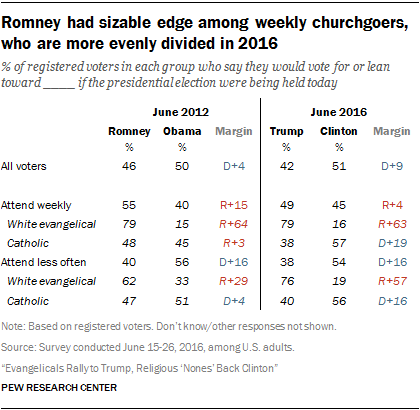 At a similar point in the 2012 campaign, Romney held a 15-point advantage among weekly churchgoers. And exit polls conducted on Election Day showed that Romney ultimately beat Obama by 20 points among voters who attend religious services weekly. The shift in preferences among weekly churchgoers is driven largely by Catholics. Today, Clinton has a 19-point advantage among Catholic voters who say they attend Mass weekly, whereas Obama did not hold a lead at all among this group in June 2012. Clinton currently holds a 16-point edge among voters who say they attend religious services less than once a week, which is identical to the lead Obama held among this group at a similar point in 2012. But within this category, white evangelical voters appear to have swung even more strongly toward the GOP candidate since 2012 (76% now support Trump vs. 62% who supported Romney). Among Catholics who attend Mass less than once a week, 56% support Clinton today; 51% supported Obama in June 2012. While the voting intentions of most religious groups resemble those seen in the last presidential campaign, there are some notable differences in the level of enthusiasm religious groups express about the current crop of candidates. On the Republican side, white evangelical Protestant voters are, if anything, more strongly supportive of Trump than they were of Romney at a similar point in the 2012 campaign. Today, 36% of white evangelicals describe themselves as strong Trump supporters, whereas just 26% described themselves as strong Romney supporters in June 2012. On the Democratic side, both black Protestants and religious “nones” are noticeably less enthusiastic about Clinton than they were about Obama in 2012. For instance, 55% of black Protestants describe themselves as strong Clinton supporters, compared with fully eight-in-ten (81%) who described themselves as strong Obama backers four years ago. Across the board, members of nearly all major religious groups express less satisfaction with this year’s presidential candidates as compared with 2012. Fully two-thirds of religious “nones” say they are “not too” or “not at all” satisfied with the choice between Clinton and Trump, as do six-in-ten white mainline Protestants (61%) and white Catholics (59%). In 2012, by contrast, half or more of these groups said they were “very” or “fairly” satisfied with that year’s presidential candidates. Voter discontent with the 2016 presidential candidates is also evident in the large share of Americans who see their choice mainly as a vote against their opponent rather than in support of their favored candidate. Overall, roughly half of registered voters say they are voting mainly against a candidate (26% choose Clinton mainly as a vote against Trump, 23% choose Trump mainly as a vote against Clinton). At a similar point in 2012, only about a third saw their choice mainly as a vote against the opposing candidate. 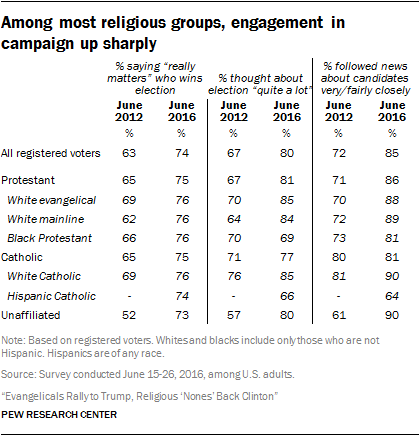 Even as satisfaction with the choice of candidates has declined, engagement with the campaign has spiked significantly across many religious groups. Roughly three-quarters of all religious groups now say it “really matters” who wins the election, compared with about two-thirds or fewer who expressed this view in 2012. 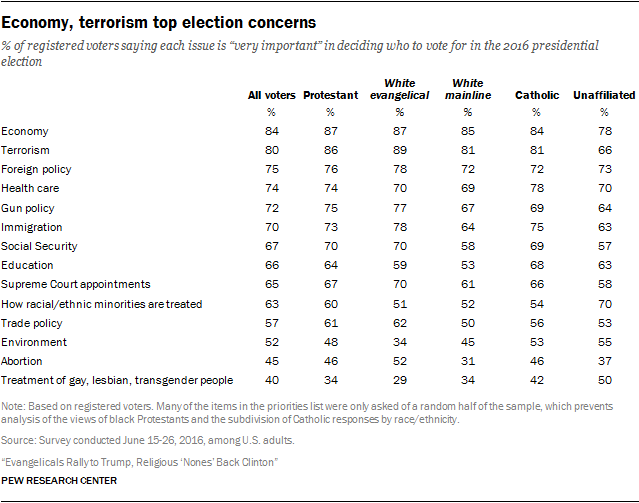 The share who say they have thought about the election “quite a lot” is up 10 points or more across many religious groups. And eight-in-ten or more in nearly every religious group say they have followed news about the candidates at least “fairly” closely; the only exception is Hispanic Catholics, among whom two-thirds say they have followed news about the candidates “very” or “fairly” closely.